Standing desks in the workplace are becoming increasingly popular in New Zealand. The negative impact that sitting at a desk all day has on your health and wellbeing is now common knowledge, and the clear benefits of being active during your work day means the electric sit/stand desk is an obvious choice for any office environment. 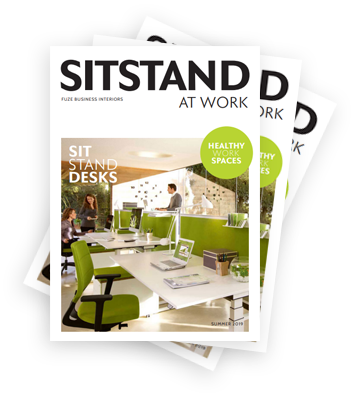 Let's take a look at why sit stand desks are fast becoming commonplace in the workplace. Studies have shown that sitting for long periods slows your metabolism, puts pressure on your organs, strains your muscles, and the inactivity creates lethargy and contributes to slower brain function. It can increase your risk for heart disease, certain cancers, diabetes and even early death. Alternating between sitting and standing to work has shown to decrease existing back pain, improve circulation, decrease fatigue, increase fat burning, reduce the risk of major diseases, and even prolong your life. Electric height adjustable desks are the most practical and efficient option for a sit/stand office. They are quiet, smooth, fast, and easy to adjust. The less practical manual crank height adjustable desks offer less efficiency and sit at a similar price point. environment, there are many benefits to using an electric sit/stand desk. Workers take shorter and fewer breaks and have higher energy levels when using sit to stand desks. Body part discomfort decreases an average of 62% and the occurrence of injuries and illnesses decrease by more than half. Happier, healthier employees take fewer sick days - with less joint stiffness, back pain, and fatigue. The Electric Sit Stand Desks from Fuze Business Interiors have stylish, functional designs that will enhance any office space. Employees that are happier, healthier and more productive translates into an improved working environment and increased staff retention. Recent studies found that the enzymes that are responsible for burning fat shut down when we sit. Standing to work helps to reduce weight. We create balanced and inspired workspaces people love, with quality products, smart space planning and design, and the commitment to help increase efficiency and productivity in the workplace.